Many luxury smartphone makers see their work mainly as a matter of wrapping an ordinary device in upscale materials, maybe adding a concierge service and calling it a day. Gionee, however, is taking a different approach: it’s giving you one huge feature that gives you a clear reason to pay a premium. It just launched the M2017, a metal-and-leather 5.7-inch phone whose centerpiece is its enormous 7,000mAh battery. Yes, there’s a real chance that it has a larger power pack than your tablet. The company estimates that it’ll last for nearly 32 hours of talk time and 26 hours of non-stop video, or enough to get you through a few days of moderate use. If you’re a jetsetting business type (Gionee’s target market), you might never need to plug in during that all-important day trip. Thankfully, the M2017 is (mostly) above-average beyond its epic longevity. It packs a curved quad HD AMOLED screen that’s bound to be noticed, a hefty 6GB of RAM, at least 128GB of storage, a front 8-megapixel camera and two rear cameras (12MP and 13MP) that promise an iPhone 7 Plus-style 2X optical zoom. You get a front-facing fingerprint reader, too. About the only major head-scratcher is the use of a mid-range Snapdragon 653 processor. While that’s not a slow part by any stretch, it probably wouldn’t have killed Gionee to include a Snapdragon 821 and deliver performance that matches the battery life. When the M2017 goes on sale in China on January 6th (an international release isn’t likely), it’ll start at RMB 6,999 (about $1,007) for a 128GB version and jump to RMB 16,999 ($2,446) for a 256GB model. This isn’t the most expensive phone on the market by any means — it’s closer to mainstream devices than the several thousand dollars you typically pay for posh handsets from the likes of Vertu and Lamborghini. It’s far from a trivial purchase, however, and Gionee is clearly betting that you’re willing to spend a lot to both flaunt your success and use your phone non-stop. When Cyanogen announced its services and nightly builds were ending, it said the CyanogenMod open source project would continue on. However, after the latter made a blog post calling the action a “death blow” for CyanogenMod, the DNS routing for its website went away and it has been unreachable. The open source team also said in its blog post that it would continue the project, and a new website indicates we’ll get more information on its follow-up, LineageOS, on Tuesday. Comment from discussion PSA: cyanogenmod.org services shutdown. In a post on Reddit, the team also notes that its code review and merge process should be available by then, so that work on the operating system can go on. Team member haggertk calls LineageOS “a 100% bare fork — LineageOS source == CyanogenMod source,” while another member said the plan is for users to be able to update from CyanogenMod without reformatting. We’ll find out more information soon, but at least now it should be easier to tell the difference between whatever Cyanogen Inc. becomes and what CyanogenMod/LineageOS is. Louis CK helped prove that artists can make good income by selling videos directly to fans, but getting his comedy shows to your phone can be a bit of a headache if you’re unfamiliar with the intricacies of local file syncing. As of this week, though, you don’t have to bend over backwards. The entertainer has released apps for both Android and iOS that let you buy, watch and listen to shows right on your device — there’s no sideloading required, and no third-party studios getting in the way. As Louis explains in a newsletter, this is really a mobile version of his website, just optimized to make your life easier. The pricing is the same $5 per show (less for most Horace and Pete episodes), and anything you’ve bought before will be available the moment you sign in. You’ll also get notifications for new shows and tour dates. There is a question about how the app works on iOS: is Louis giving Apple a cut of in-app sales like other developers, or raking it all in? We suspect the former (at least if he wants to abide by App Store guidelines). If so, it might be best to buy that stand-up special on the web if you want to make sure that Louis gets his full share. One of the reasons why Pokemon Go was such a success is because it got people out and about during the summer. Now that winter is settling in and the snow is starting to fall, however, the developers at Niantic Labs have to figure out a way to keep people playing. Beginning on Christmas Day morning, Pokestops will dole out a single-use incubator. More than that, until January 3rd you’ll have a better chance of finding Togepi, Pichu and other Johto-based eggs. To further celebrate the season Pikachu wearing Santa hats are going to be a thing as well. An adorable thing that will stick around a bit longer. Need more reason to brave the unforgiving tundra your neighborhood has become? Come December 30th, finding the original starting Pokemon (Bulbasaur, Charmander, Squirtle and their subsequent evolutions) will be easier too, according to a press release from the company. To give you a leg up in finding them, Lure Modules will double their lifespan and last for an hour. These bits only last through January 8th, though, so time is of the essence. But hey, now you have a valid excuse for taking a walk when your family members are on your last nerve. The market for smartwatches is drying up, but Google seems intent on shaking it up. We already knew that Android Wear 2.0 would arrive in early 2017, but Android Wear product manager Jeff Chang recently confirmed to The Verge that the updated platform would launch on two new, flagship smartwatches. Make no mistake, though: these aren’t Google watches, strictly speaking. While the search giant will no doubt promote them like crazy, Chang noted in the interview that the watches will bear the brand of their manufacturer rather than Google. In other words, Pixel watches these ain’t. Chang apparently referred to the deal Google has with this mystery manufacturer as akin to the long-running Nexus program, in which Google provided the software for hardware makers who could build the kind of phone Google desired. Chang’s characterization is curious, though, because Google has more-or-less backed away from the Nexus program with the launch of its Pixel phones, devices that Google developed entirely on its own. To date, the company’s bet seems to have paid off: the Pixels have enjoyed strong critical acclaim, and not even Google could correctly gauge demand for the devices, leading to delayed delivery of pre-ordered phones. Hell, check out the Google Store right now: at time of writing, at least one version of the Pixel XL is still sold out. It’s not hard to jump to the conclusion that a Google-branded smartwatch could have done well, if maybe not to the same extent. Rumors of in-house Google smartwatches have been swirling for months now, too, so what gives? While some (including your author) hoped Google would lead the Android Wear 2.0 charged with some watches of its own, it makes complete sense that Google decided not to. For one, it minimizes the reputational risk that comes with a potential failure. Think about it: people don’t seem to want smartwatches as much as they used to, and a big whiff on Google’s part could shake perceptions that smartwatches are worth the hassle. That’s no bueno for a company with a vested interest in spreading Android Wear far and wide. With that said, it also makes sense that Google would on some level want to give the actual manufacturer of the smartwatch the attention. With any luck, that attention drives sales, which spurs competition, which ultimately makes Android Wear a more palatable platform for everyone involved. A pair of Pixel watches might still be in the offing, but the timing doesn’t seem right yet. Better the rising tide of Android Wear 2.0 lift the sales of all manufacturers, rather than just directly benefit Google. Oh, by the way: Chang let slip other juicy details, like that these two watches would be the first of many in 2017, Android Pay would be enabled on all of them and that those mobile payments would work with iOS devices. That last bit could be big for Google as it continues trying to prove Android Wear’s value — smartwatches from Apple and Samsung already have elegant, built-in payment solutions. In other words, the two major companies still trying to make smartwatches a thing are enjoying a healthy lead, while Google works to enable support across the many watches to come. The NBA is rolling out a new fantasy sports app called InPlay, which will let fans have a second-screen experience during nationally televised games. It’s a slightly different concept than services like Yahoo Fantasy: InPlay syncs stats by recognizing audio from any NBA match being broadcasted on pay-TV, using your iOS or Android device. Once you pick the player you think is going to do well, the application will show you how many points he’s earning you in real time. And if you end up outperforming everyone else playing the game, the league says you could win official NBA swag. You can download it now from the App Store or Google Play, but you won’t be able to play it until tonight’s games. After that, the app should work with broadcasts on ABC, ESPN, NBA TV and TNT. Atari has just released RollerCoaster Tycoon Classic, a “new” game for mobile based on the Atari-produced theme park sims. Classic takes its cues from the original RTC and RTC2, offering a more simple take on park design, construction and management than more recent titles in the series. It’s also the first RTC game for mobile that isn’t stuffed full of microtransactions. Instead, you pay $6 (£4.50) once and then you own the game. Innovation! Okay, so there are a few in-app purchases. Two content packs — “Wacky Worlds” and “Time Twister” — based on the RTC 2 of the same name are available for $1.99 (£1.50) each. There’s also a Toolkit that lets you edit scenarios, design rides and so on. It also lets you import / export saved parks with cross-platform support for RTC 2 on PC, but that comes at a price: another $6. All-told, unlocking everything would cost $16, but unbundling it in this way makes sense given many will have no interest in the Editor or additional content. After the microtransactional mess that was RCT 4 for mobile, and the poorly received RCT World for PC, it’s genuinely surprising to see that Atari actually understands what people want from an RTC title. You can check it out on Google Play or the App Store now. Facebook has rolled out a new system aimed to make logins easier for its users and, by extension, its ad partners. The latest developer Account Kit SDK now includes instant verification, a two factor system that lets you skip the usual drill of receiving an SMS and then entering a code. When you attempt a Facebook login for a third-party site and enter your phone number, “we attempt a match with the verified phone number listed on the person’s Facebook profile,” the company said in its developer blog. The system only works if you’re logged into the Android Facebook app on the same device. If so, it can verify without sending a one-time password via SMS, and if not, you’ll receive a text on your smartphone and will need to enter it on the other device. “This feature is used only to improve the verification process in a secure way and no additional Facebook information is shared with the app,” the social network adds. Instant verification produces a 97 percent conversion rate, making it highly likely that users will successfully log in to partner sites. Facebook ads that it’s particularly useful “in areas of the world where SMS delivery is not reliable.” Citing partner Familonet, it says the instant verification method boosted conversion rates by five percent. That’s a nice convenience for Facebook’s users and partners, but is it secure? Instant verification still relies on SMS, which isn’t exactly a panacea, as the US government recently said. The alternative is custom apps that generate much more secure codes like Google’s Authenticator, or even hardware dongles that work in a similar way. For now, it’s still the best bet for keeping you secure, along with a non-terrible password. The Sling TV team has inadvertently spilled the beans on its previously leaked media hub for cord cutters. Zatz Not Funny discovered a briefly available landing website for the AirTV Player, and it’s clearer than ever that Sling (read: Dish) is catering to those determined to leave cable and satellite behind. The set-top box will revolve around a home screen that merges over-the-air TV tuning with not only Sling TV, but Netflix — you won’t have to jump between apps or devices to watch both your local news and the latest season of Black Mirror. And since this is an Android device (notice the “G” button on the remote), there’s a good chance that other online services will be available as well. It’s not certain how much the AirTV Player will cost or when you can get it in your hands. However, a launch at CES in January seems likely given that Dish tends to have a major presence at the trade show. It could be a big deal if there aren’t any rude surprises in the pricing or execution, though. Until now, you’ve typically needed a separate over-the-air TV tuner device (like Nuvyyo’s Tablo DVR) if you wanted local live programming wrapped in a slick interface. That won’t be necessary here, as you can just buy one gadget that covers both your local TV and streaming needs. No matter how well it works, it’s clear that Dish wants to give you as many reasons as possible to skip rivals like PlayStation Vue and DirecTV Now. This year alone, 1.4 billion smartphones will be sold, giving more people have access to gaming devices than ever before. But with more than 1,000 new apps flooding the App Store every day, it’s increasingly difficult for new titles to make an impact. Every so often, a game like Pokémon Go comes along, proving that if you have the right “hook,” you can find a massive audience. NaturalMotion believes technology is its hook. The British gaming studio started life creating animation engines, with its software used for everything from The Lord of the Rings movies to Grand Theft Auto V. It then packed that tech into mobile games like Clumsy Ninja that, thanks to their visual edge, quickly topped the App Store. That success led to the studio being bought for $527 million by casual-gaming giant Zynga. It’s been nearly three years since the acquisition, though, and the pressure is on for NaturalMotion to deliver a fresh hit. The studio is hoping that pushing the processing power of modern smartphones is enough to get players downloading again. Moving away from the simple titles that built them an empire, NaturalMotion’s latest title, Dawn of Titans, is the developer’s first foray into action-strategy gaming. 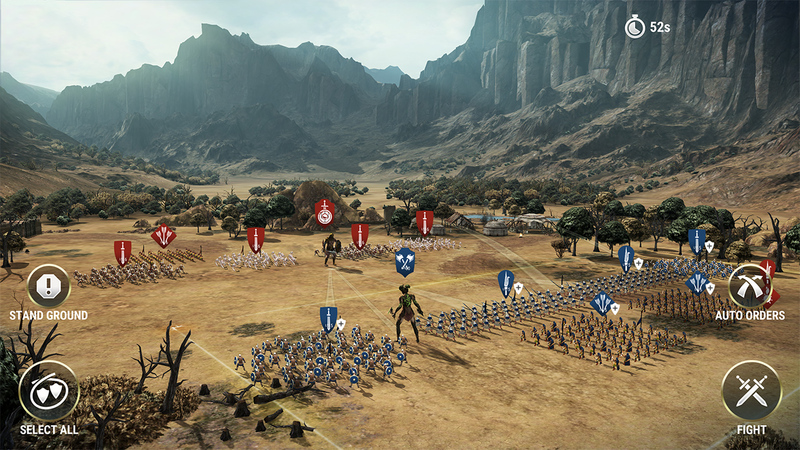 For a mobile game, Dawn of Titans offers an unusual sense of scale. 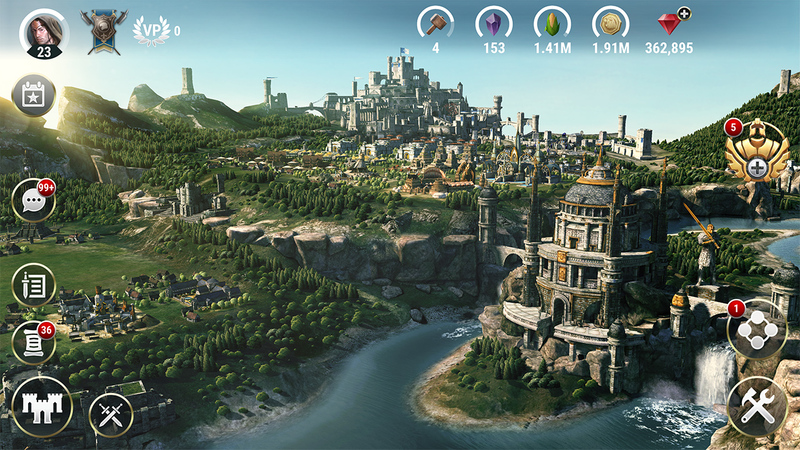 Upon opening the app, you find yourself looking over an intricately detailed floating kingdom, fully rendered 3D castles and buildings sitting before you as tiny villagers wander around them in real time. It’s a level of detail you’d expect to see in a console game, not on an app’s home screen. Although not quite as detailed, the battles themselves are also pretty spectacular. With the studio clearly taking cues from Creative Assembly’s Total War series, Dawn of Titans sees you leading thousands of soldiers into battle against either real-life or AI-controlled foes. Combat is simple: Skirmishes last around a minute, and you command each type of unit to attack with the flick of a finger. Most of the real strategizing takes place long before any swords clash. Offline missions and online fights reward you with in-game currency, and between matches you train your units and equip your most prized warriors. As enjoyable as Dawn of Titans is, it needs to do more than impress gamers like me. Facebook gaming has fallen by the wayside and NaturalMotion’s parent company Zynga’s relevance and profits have declined with it. The Farmville creator has bet big on NaturalMotion, and despite performing well initially, the company’s first game since the acquisition, CSR Racing 2, has since dropped out of the top 50 on the App Store charts. A lot is riding on Dawn of Titans‘ success. But its competitors reportedly spend almost $1 million a day on star-studded ad campaigns, and NaturalMotion is going to need more than just word of mouth to succeed. Reil argued that Zynga has the resources to compete. “If we want to compete with Clash of Clans — with any of these companies– we can,” he says. I’m not so sure. That may have been true in 2012 when Zynga was valued at $11.5 billion, but now the company is worth just $2.4 billion, less than a quarter of Clash of Clans maker Supercell (which also has the financial clout of Tencent, a $250 billion company, behind it). Since my discussion with Reil, Dawn of Titans was released on both Android and iOS. As of December 19th, it ranked 64th in the App Store’s “Top Grossing” list and 50th in the corresponding Google Play chart. It’s off to a decent start, for sure, but with Zynga unable to match its rivals’ marketing budgets, Dawn of Titans will have to hook a lot more players if it’s to succeed in this cutthroat market.